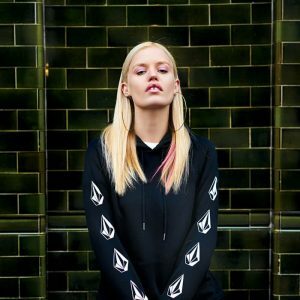 Georgia May Jagger and Volcom Women’s have collaborated once again to bring you a holiday collection that shines. Inspired by 90’s youth and Volcom menswear, Georgia May took a masculine concept and added her feminine touch to make this our coolest holiday collection yet. We got a chance to sit with Georgia to talk about the holiday collection and our London photoshoot! When thinking of a location to shoot your collab in London, you picked a pub, what do you like about this kind of location for your collab story? GEORGIA: It’s quintessentially British and since it’s winter I wanted to be somewhere inside for the shoot so a pub seemed like the perfect location. What makes a pub in London different than anywhere else in the world you’ve visited? GEORGIA: Londoners! It’s the people that make the experience so different and great. GMJ Holiday collection shot at Birdcage Pub in London! Do you drink beer? Ale or? What’s your fav? GEORGIA: Pie and mash are my favorite. What’s your favorite piece from the Volcom x GMJ Holiday Collection? GEORGIA: I’d have to say the GMJ Pullover Fleece. I love the Volcom Stone logo on the sleeves.